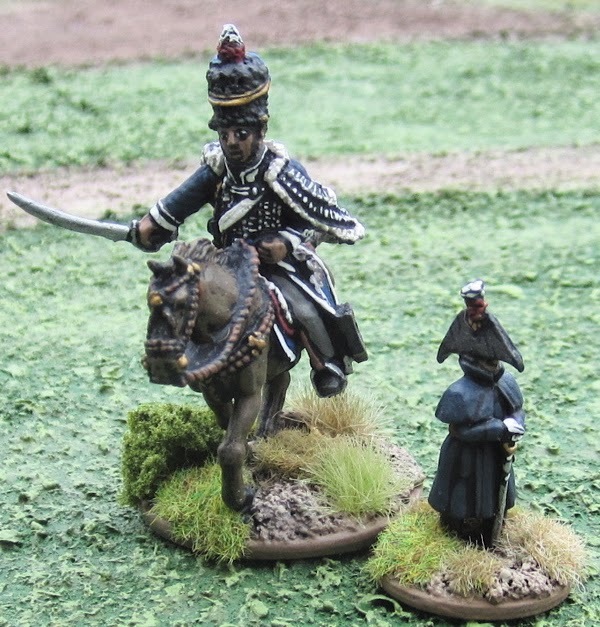 Napoleonic British Hussar from Renegade Miniatures. 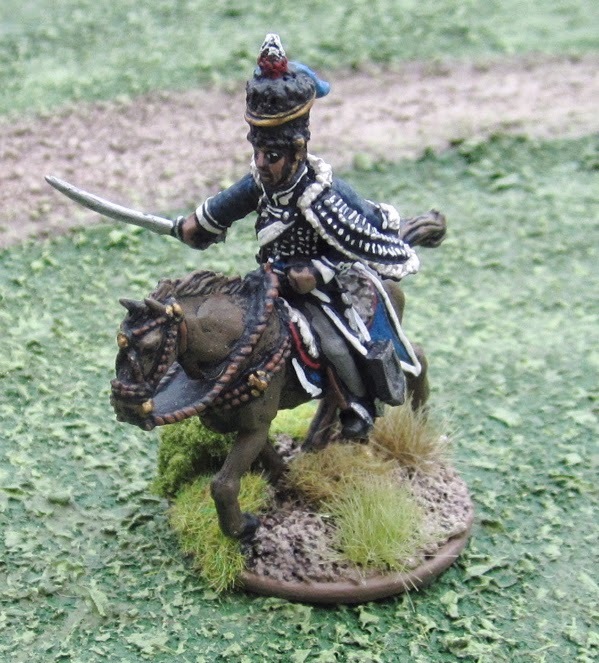 Another Shot of the Hussar. I have five more of these. I'm not really looking forward to painting them. 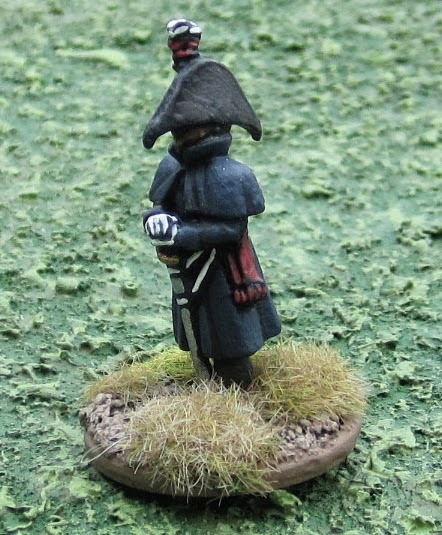 Napoleonic British officer from Minifigs. The trouble with using the Renegade figures with the Minifigs… Next to the Renegade miniatures the Minifigs look like freaking Hobbits!? 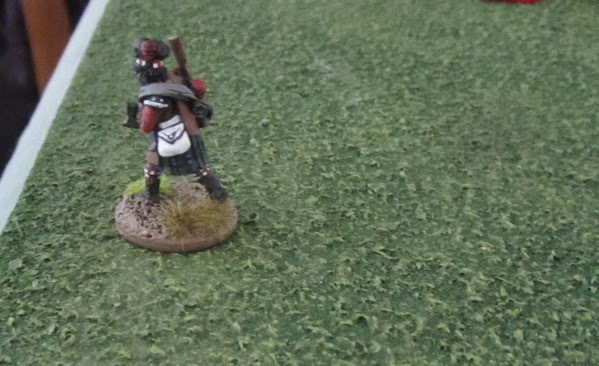 Random SF adventurer from Black Hat Miniatures that I picked up for a future Rogue Trader> campaign. Some Mediaeval/Fantasy adventurers. The fellow on the left is oen of the oldest figures I have – picked up 25+ years ago to play D&D with… I have no idea who the manufacturer was – I stripped a bunch of figures of this era a few years back to repaint… The two in the middle are from Mega Miniatures and the one on the right with the halberd is from Front Rank Figures. 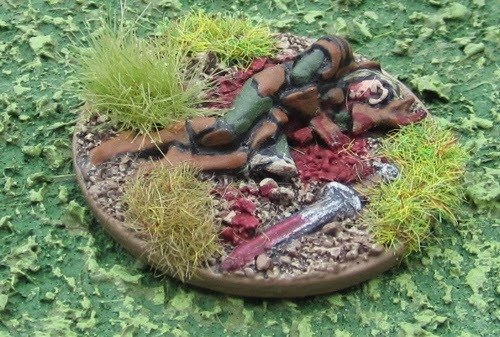 Two Mediaeval/Fantasy Human adventurer casualties – I think they were from Dixon Miniatures. 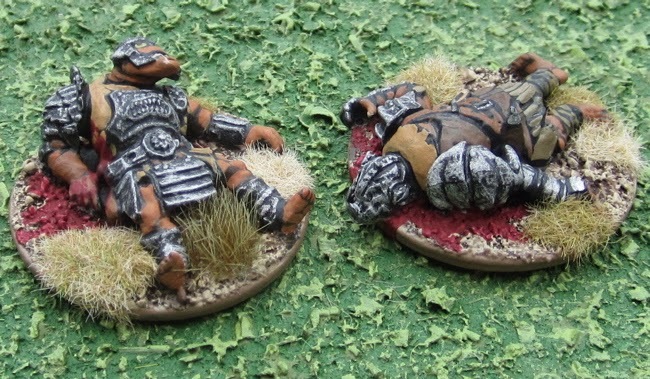 Two Orc casualties I converted from Mantic figures. Two Dark Elf Casulaties I converted from old Citadel (Games Workshop) plastic miniatures. 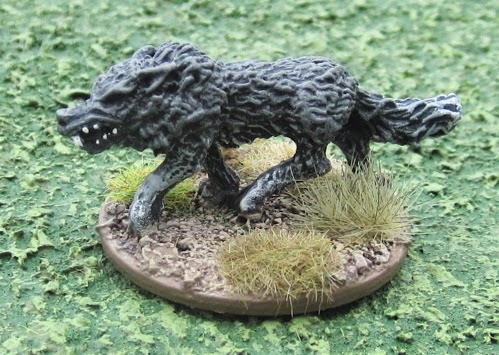 An old Citadel (Games Workshop) Dire Wolf. Four old Citadel (Games Workshop) Skaven figures. A while back my friend John gave me his old Skaven WFB army. I took a bunch and rebased them to make a Hordes of the Things Army. The rest I’ve been trying to reorganize lately to paint/repaint to make a couple of warbands for A Song of Blades and Heroes (or Mordheim?). One I figured I’d keep for myself – the other I’ll give back to John. 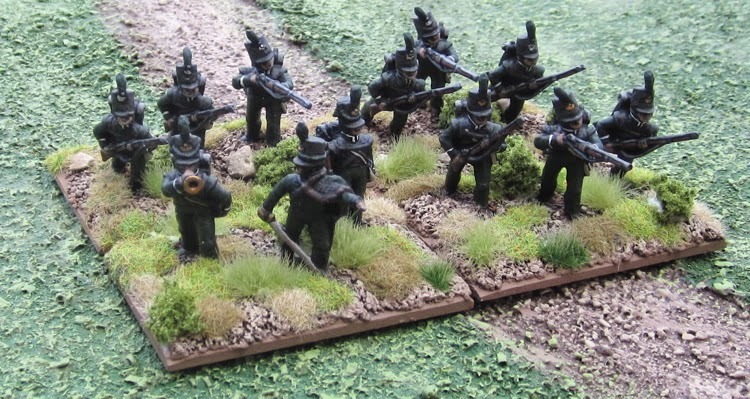 This lot are in the “for me” warband. 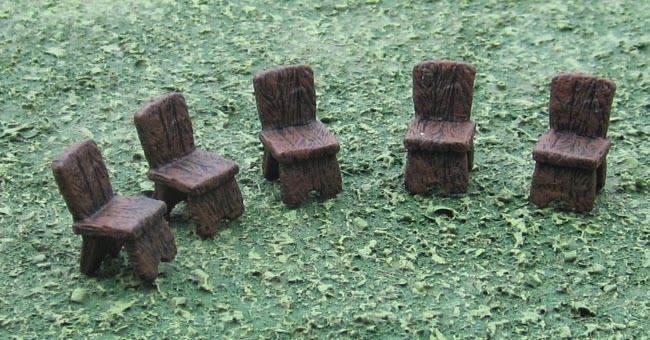 A few chairs - I think these were also from Mega Miniatures. Orcs have been raiding the local area and taken some friends of our heroes as slaves. The Orcs must be dealt with and the slaves freed! 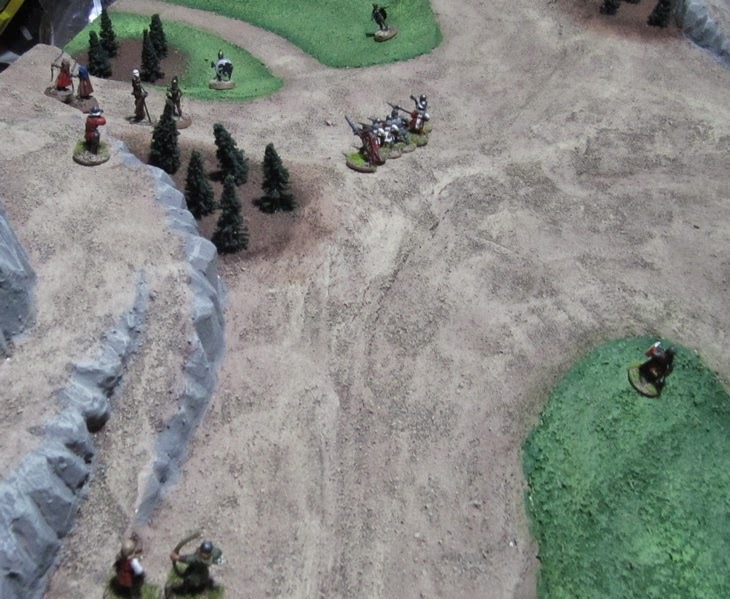 I seem to recall the very first move the good guys tried they rolled a turn over… I figured the orcs were still unaware for their presence and let them have another go. 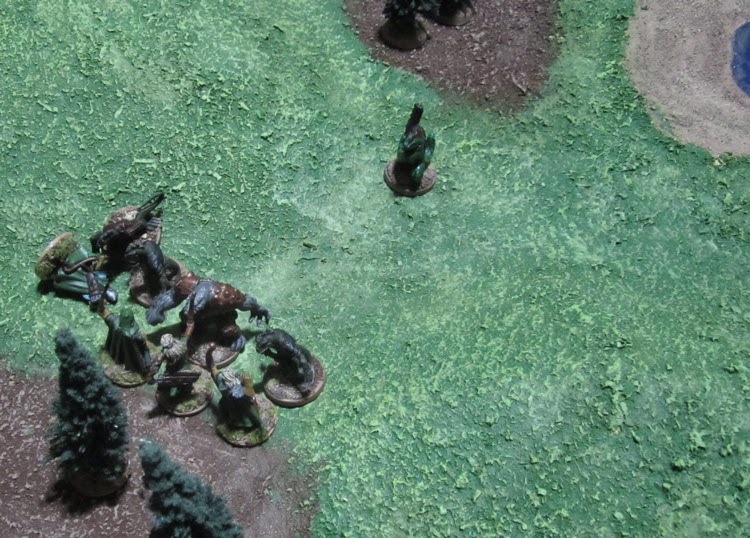 Again they didn’t get through moving all of their guys before someone tripped on a root and alerted the Orcs of their presence. 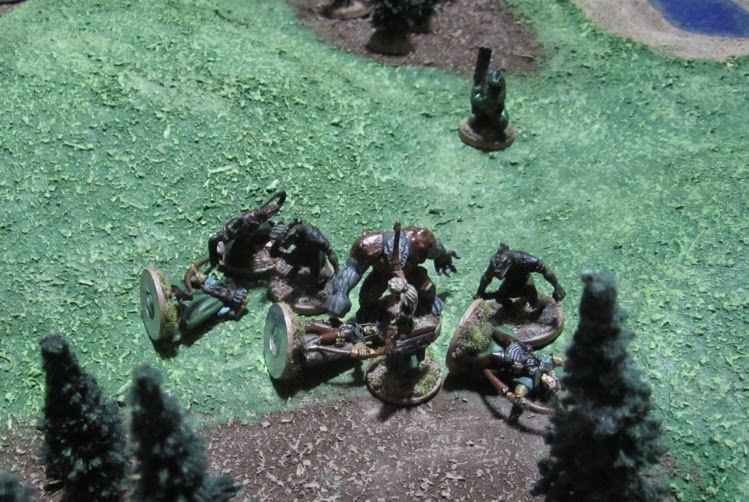 Orcs spread out through the woods and swamp to meet their attackers. 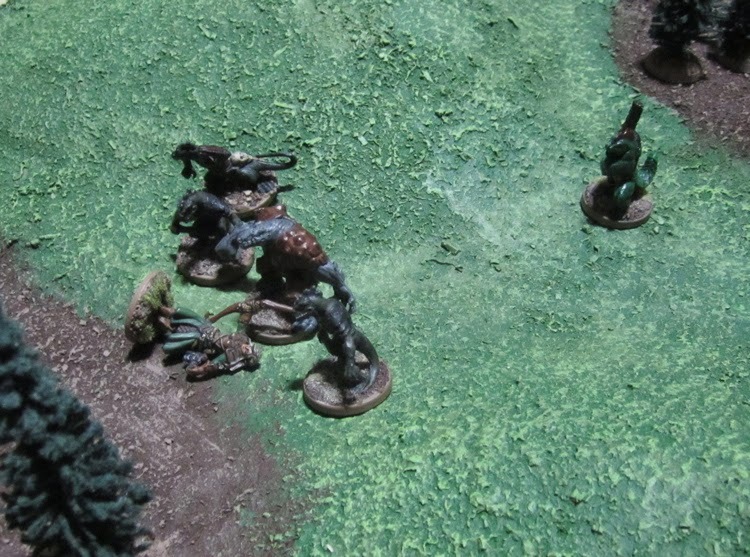 The Orcs were quickly taken care of… I think the Ogre was the first to be taken down. The Orc Warboss was a bit more work, but in the end all the orcs were slaughtered, no one on the Good Guys side were seriously injured, and everyone seemed pretty stoked to have another go – or try Tale of Blades and Heroes next time! Huzzah! A win for all in my books! Ah, well.. everyone had a tonne of fun and the Boy claimed it was his favourite game ever. 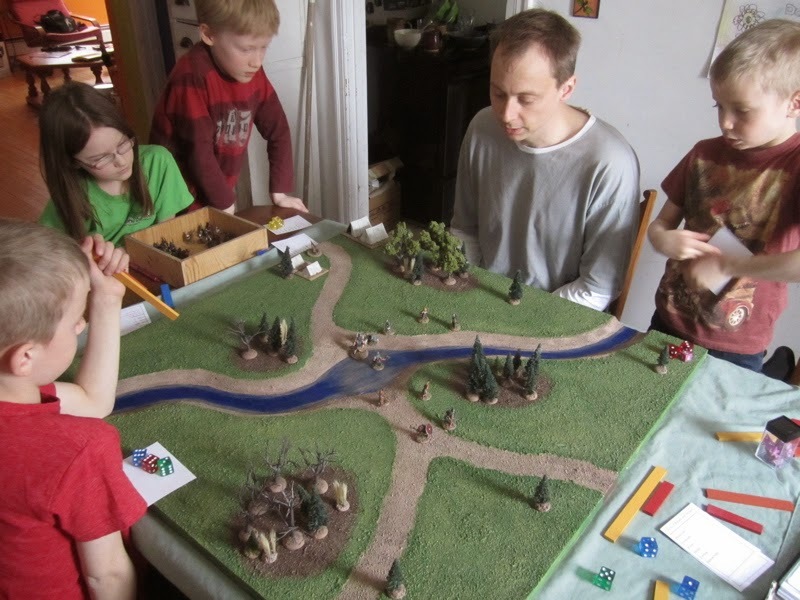 Here, finally, is the final round of our Song of Blades and Heroes Campaign…. These games were played almost two weeks ago now and so while I do have the pictures I didn’t take a lot of notes or anything and the memory is getting abit hazy. So I’m not entirely sure how some things went down (should have done this earlier when it was all still fresh in my mind!). I’m not 100% sure the forces listed are exactly what was played with… but hopefully it’s pretty close. 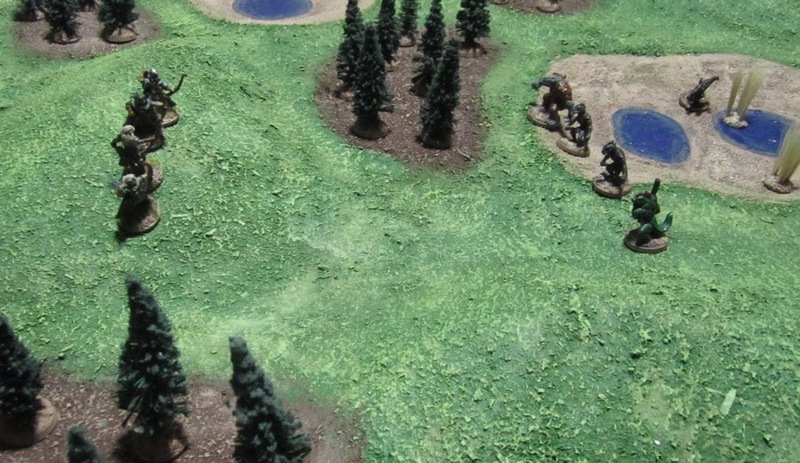 Finnegan’s lizards charging across the battlefield as fast as they can – to close with the Elves before they are murdered by their vicious bow-fire. 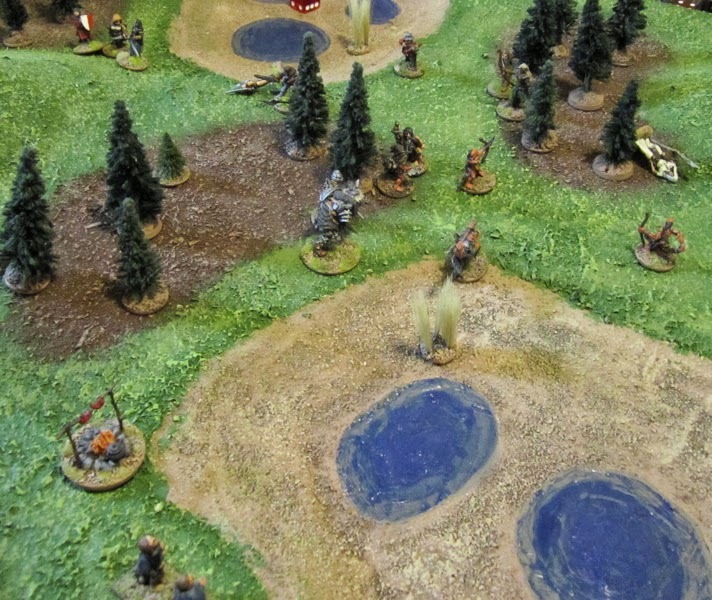 A brief regrouping – so no one goes in alone and gets surrounded and squashed. Once lizard had to (briefly) got to ground to avoid incoming missile fire! Moving up, still taking fire – but most of the arrows were simply bouncing of the lizards hard scales. 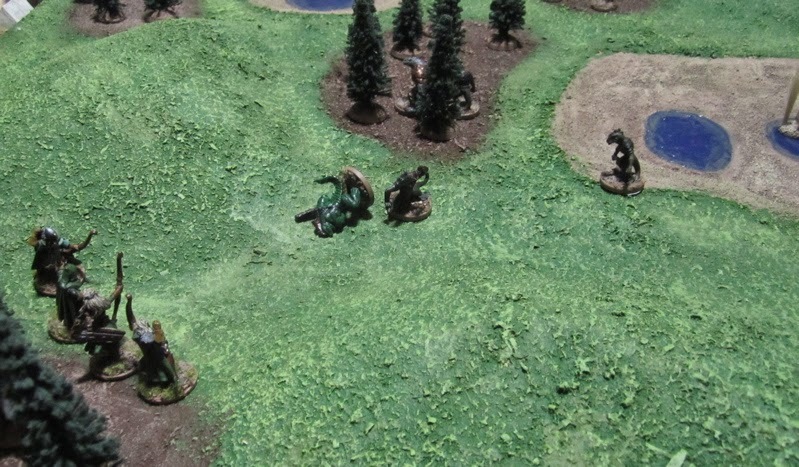 Another Lizard staggered and the Elves start trying to shift their position to keep their distance from the Lizards. But they didn’t shift quick enough of far enough and the Lizards were soon upon them! Once they were in combat it was bad news for the Elves. 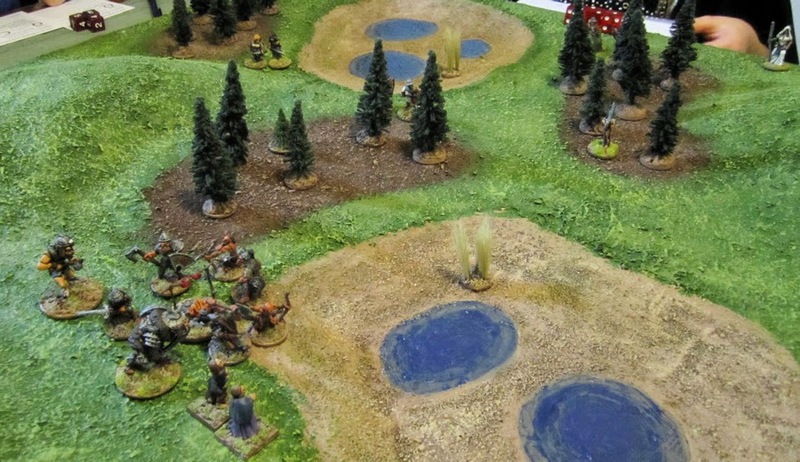 The lizards had the numbers and were all higher in Combat ability. The elves were quickly taken down. The Elf leader was the last to fall. 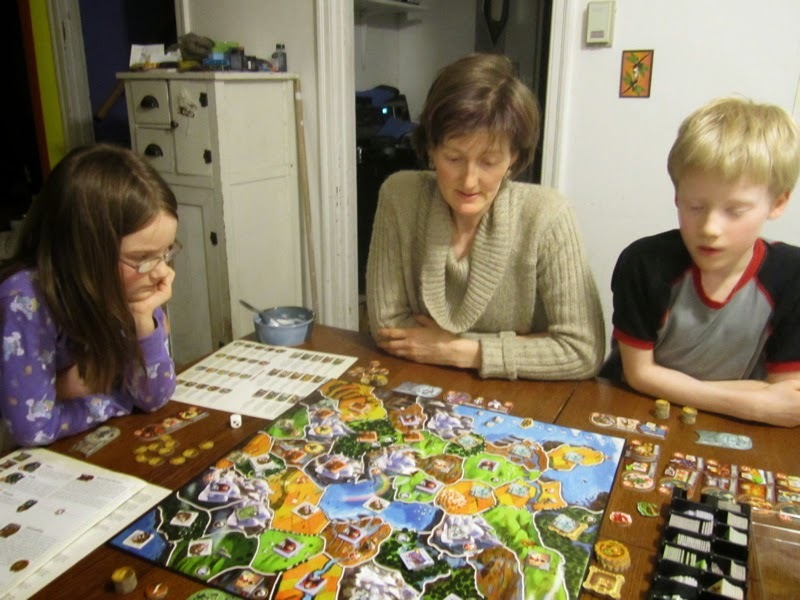 We did go through the post game procedure for checking injuries and collecting income and Exploring and such – because at this point, I think, we figured we might play that sixth game. 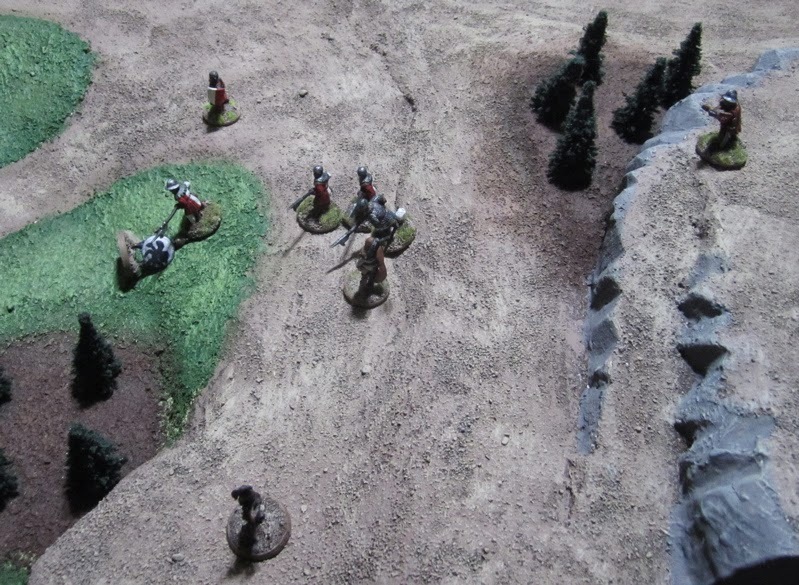 The Elves leader and regular archer were fine – they simply must have ducked out and faded into the forest. 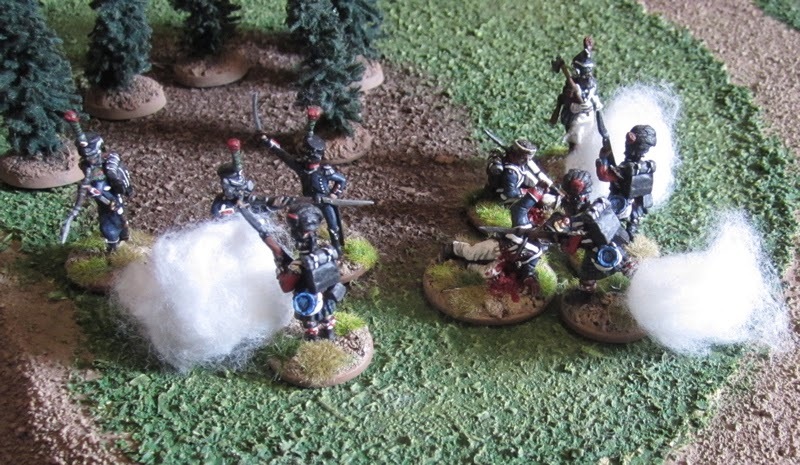 The two elite archers were in a bit of a bad way and would have to mis the next game due to their serious injuries! This would have left her with only TWO figures (and whatever she could hire with her income from this game!?). Luckily Amanda collected 40 gold for income – which would have allowed her to at least hire a new Elf Warrior. Finnegan only collected 10 gold, but he later came across a temple during his exploration and sacked it for another 10 gold. Amanda found a magic well, which she ignored. 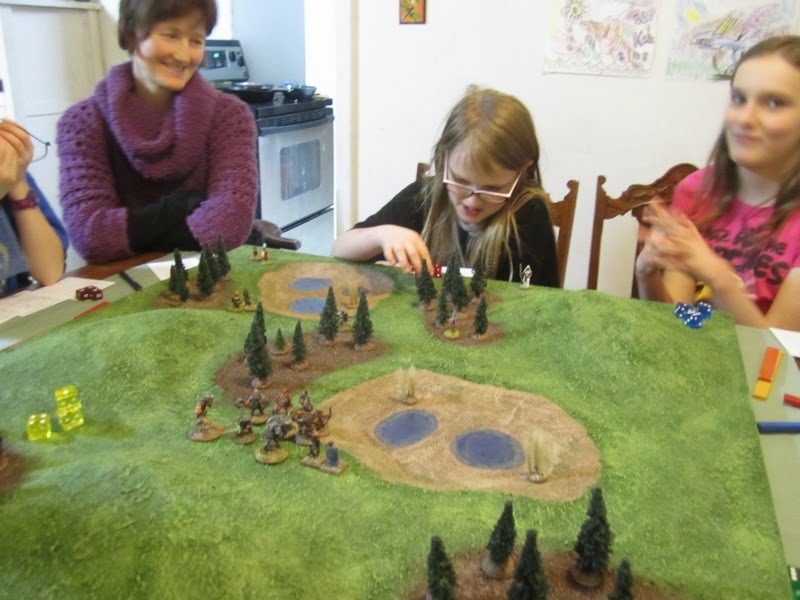 Part of the reason Amanda was completely outclassed in this game was because Finnegan’s lizards had two more games on her fey fold and had improved with experience. Most of them were Q 2+ and C 4 and Amanda’s were only Q2+ and C 3 – and there were far fewer of them! 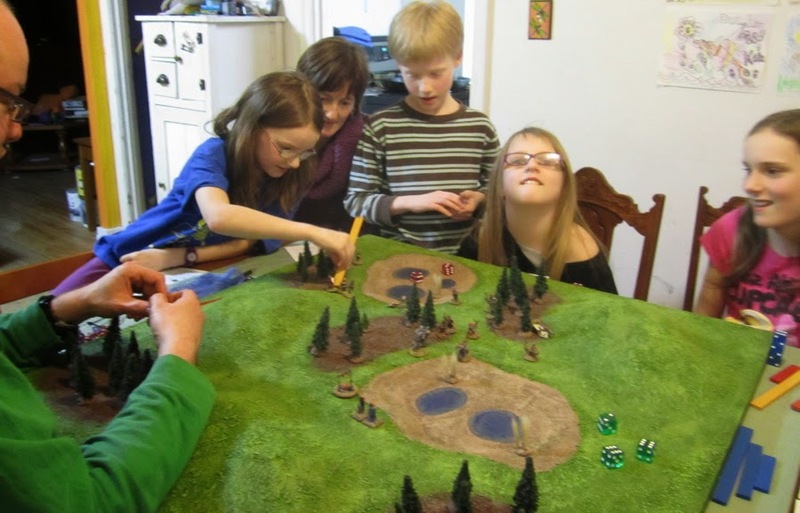 Another game would have seen Amanda’s surviving Elf archers get to C 4 and that would have made a huge difference. 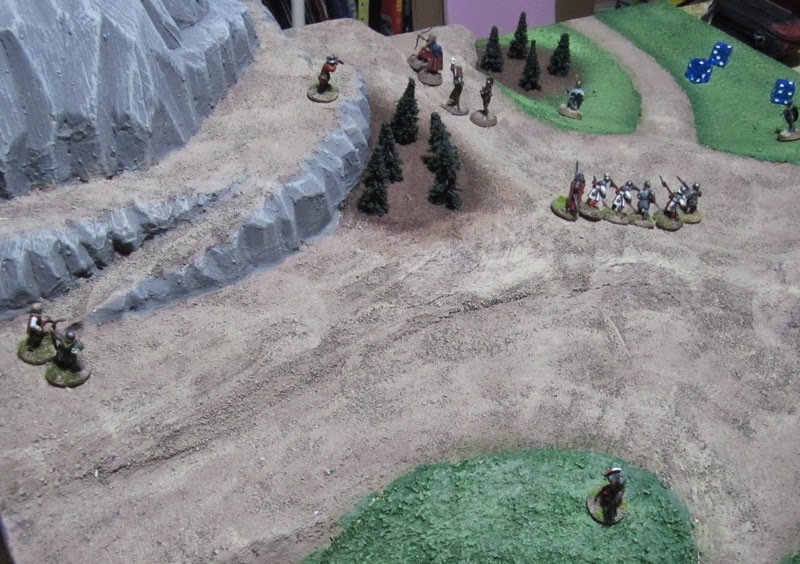 The forces of Baron Phillipe charge across the pass to deal with the “bandits” hiding out there. 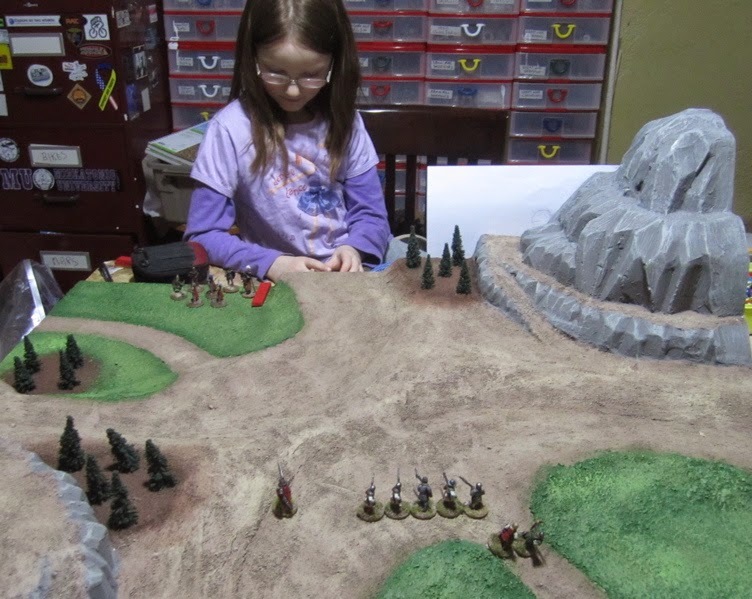 Keira decided to send her forces around the flank – perhaps trying to isolate and take out my archers and Crossbowmen one at a time… a pretty reasonable tactic. …and Baron Phillipe’s men were upon them! There’s really no honour or glory in defeating a seven year old with a force 2/3 the size of your own… but we played the game… She's an incredibly good sport about these things and wouldn't have me offering her any advantage. 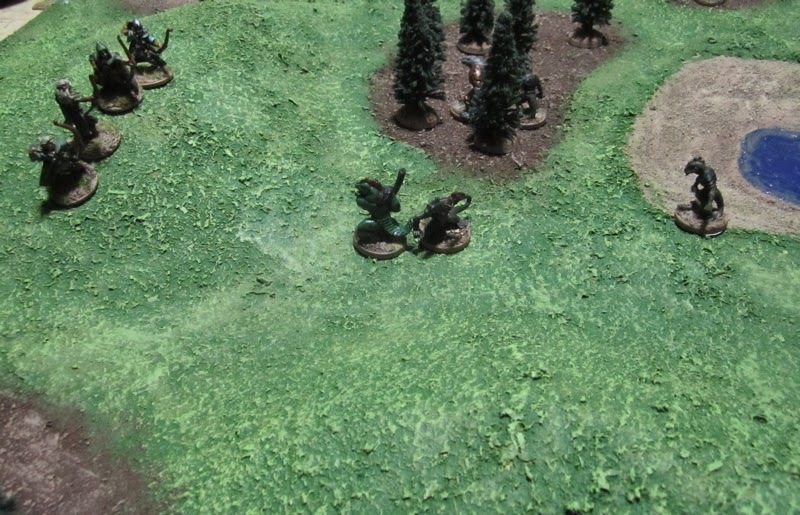 I think this was after the first morale test – few left on the table – Keira conceded. I’d suffered two casualties, but both would be back in it for the next game. I’m not sure how many casualties Keira’d had, the only note I’d made was that her leader had not healed properly and would be permanently -1C – which I think had happened to her in her previous game!? Keira collected 50 gold – but then lost one to my Theives Guild thieves. 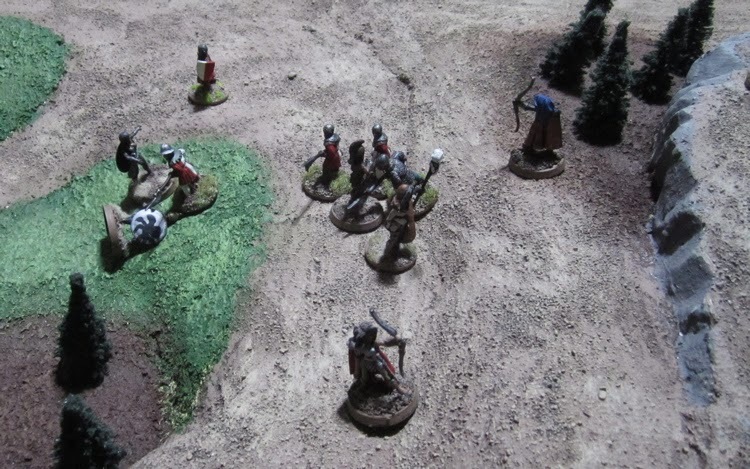 I collected 60 gold… plus the one stolen from Keira… plus the five from the Ale House… netting me another 66 gold – If we’d carried on that would have put my warband over 500 points! During exploration I’d been visited by an Adventurer’s Ghost which begged me to avenge his death. 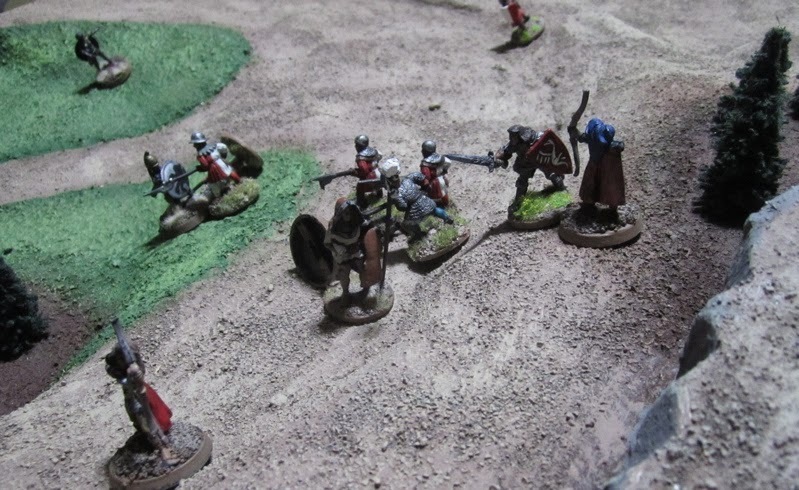 In my next game I could nominate one non-personality character in the opponent’s warband as the ghost’s assailant and if it was killed during the game the character killing it would get one extra experience. Overall I thought the campaign went very well. We all liked the campaign system and would play it again. I think, however, we might try a turn at playing more of a narrative campaign for our next one. 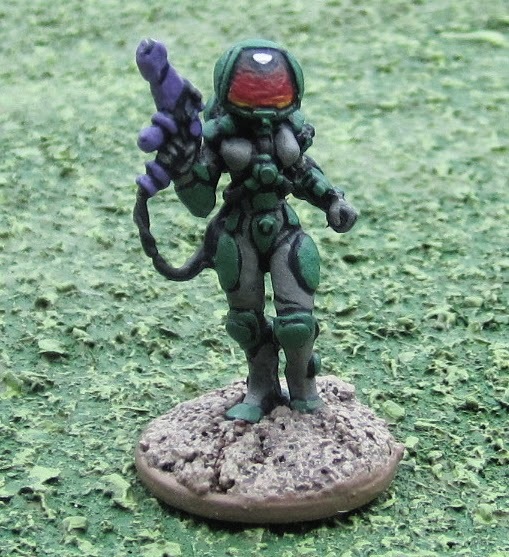 I would like to play a campaign with some other players - If I could ever get anyone out to play!? 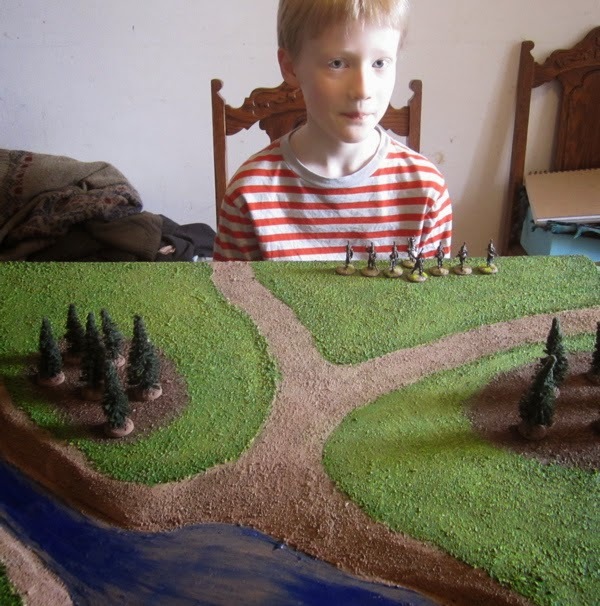 I think building some more terrain would give us a few more options for scenarios. 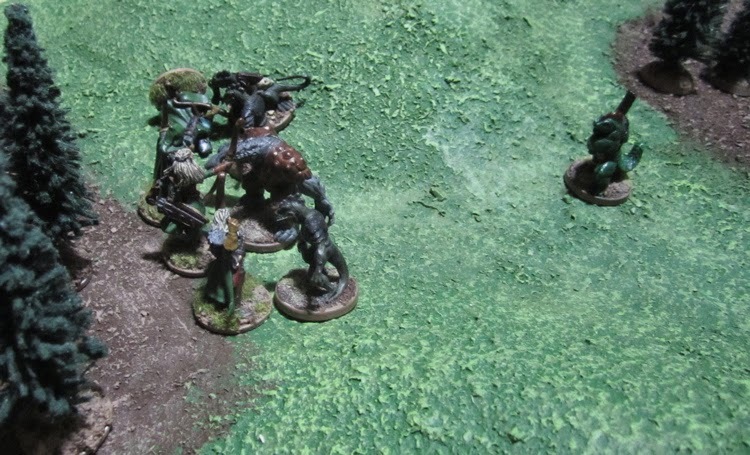 Nasty Orcsies attack our intrepid heroes in their camp just as they’re breaking their fast. How rude! 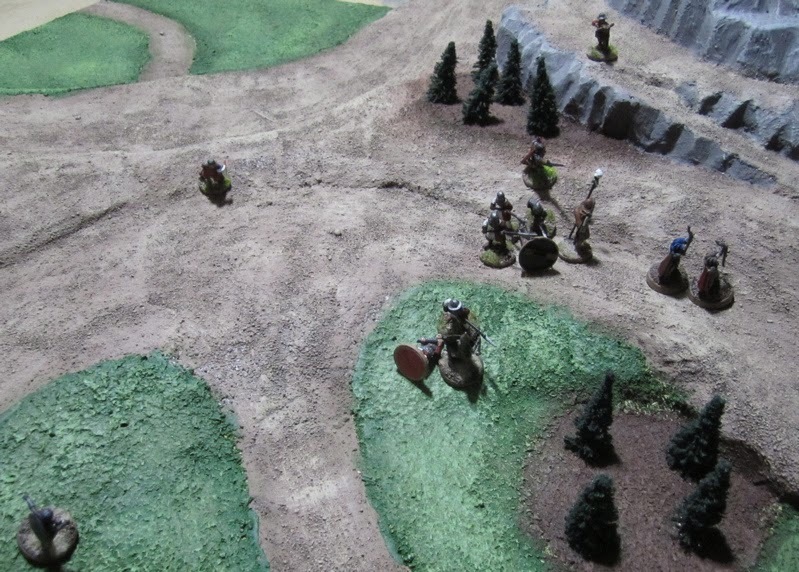 I think this was around Turn Two… My Orcs all nice and spread out… There’d been a few Turn Overs in the first rounds – Adventurers still rubbing sleep out of their eyes and downing their coffees while the Orcs advance in their rather unorganized fashion. The ogre took down axe skull with one mighty swing of his Axe… into Axeskulls.. er.. skull (what a strangely prophetic name?!). 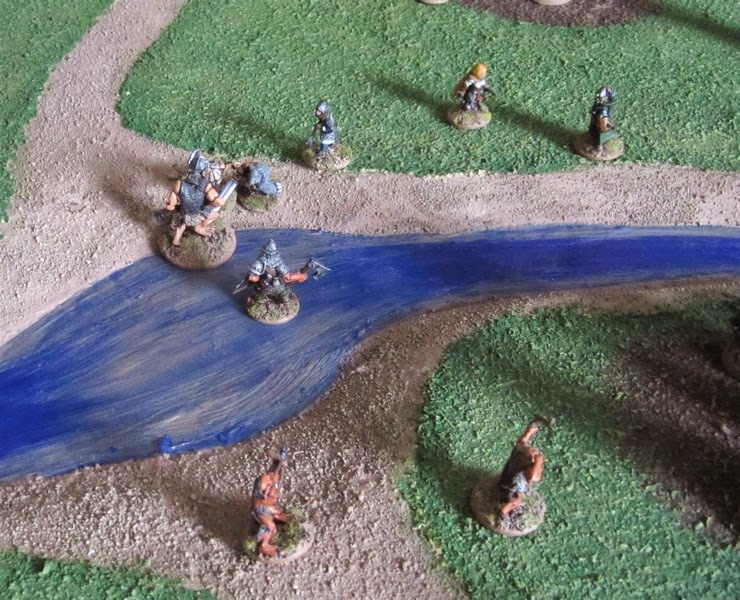 Sir Moustache charged into the river to take advantage of an Orc that had fallen in the river but found himself surrounded and taken down. A couple orcs were taken down by Stormbows arrows and a few more were taken out by Stormblade… (we decided they were brothers, separated at birth – one grew up to be a dwarf, the other grew up to be an Elf… er...?) 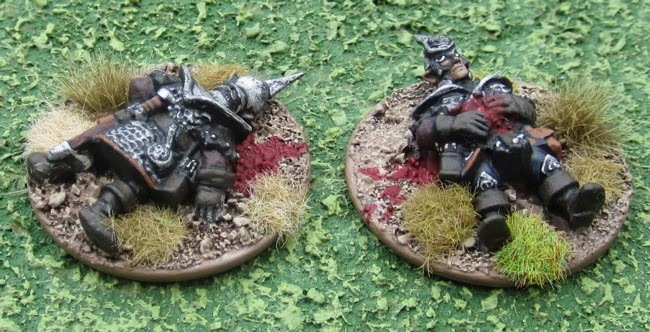 but eventually Stormbow and Shortcut also fell to the Ogres terrible blows. Normally I try not to so utterly annihilate new players on their very first game… But they all seemed to take it in stride and are keen to have another go! I only had a few Minifigs Riflemen remaining so I thought I’d best finish them up because then I could say – that unit there… DONE! Here is the whole unit in extended line. 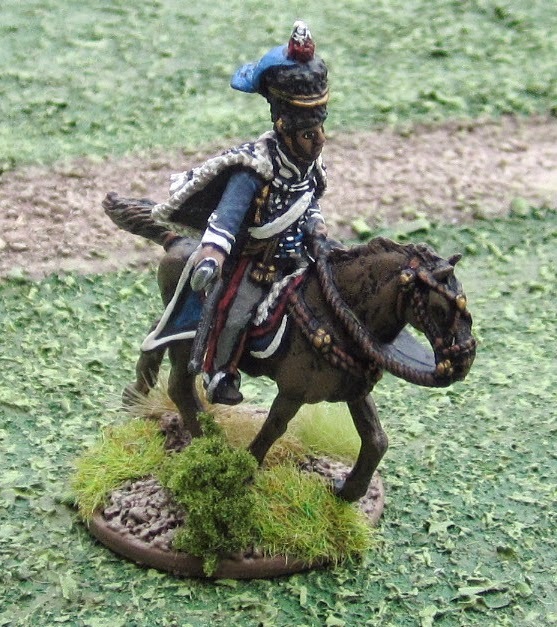 I started looking around and planning and plotting and trying to figure out what I’d need and how much it would cost to finish putting together British, French and Prussian forces for Napoleonic Wargaming… the realized it’s probably not going to happen this year. It would mean a couple hundred dollars for each - and I’ve got Great War stuff I need to get cracking on. 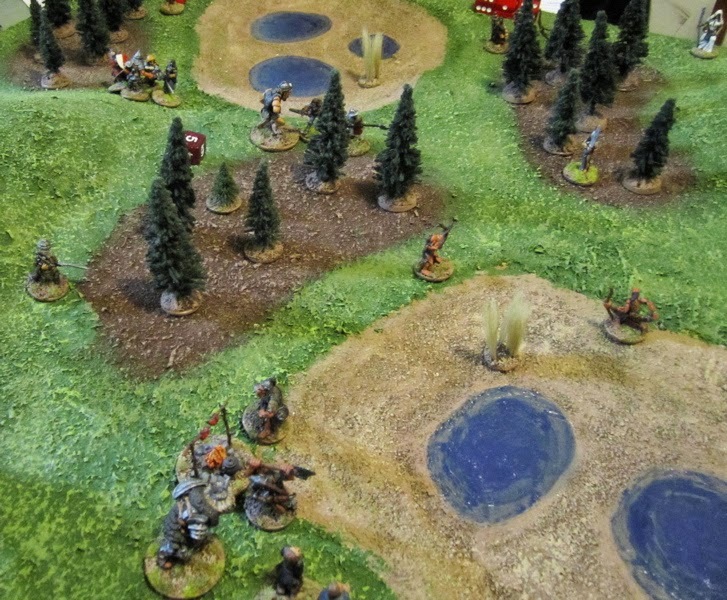 Terrain… that last game report from the campaign…. Maybe some game reports from a new game. 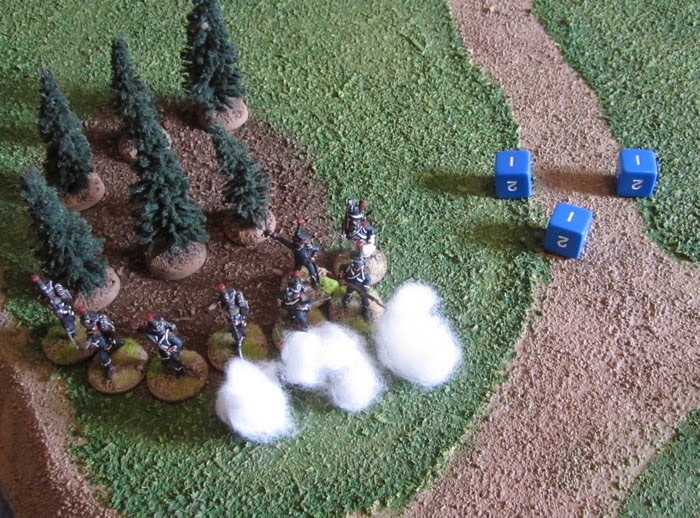 Last week I finally got around to finishing reading Song of Drums and Shakos and finished painting up some Highalnders and French Chasseurs and Voltigeur and Carabiniers… so, on Saturday, when the lad and I had some free time in the afternoon (now that his Theatre School classes have wrapped up!) we have a go at the game. 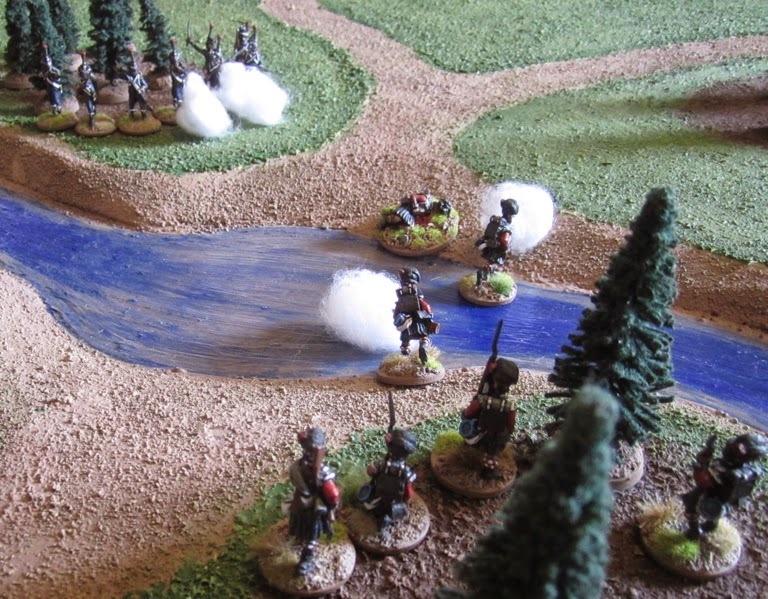 As the forces of France and the Anglo-Allied Coalition maneuver ever closer to the ultimate conclusion of their campaign at Waterloo, two opposing squads are simultaneously tasked with scouting a ford across a creek on the flank of their respective armies’ line of march. 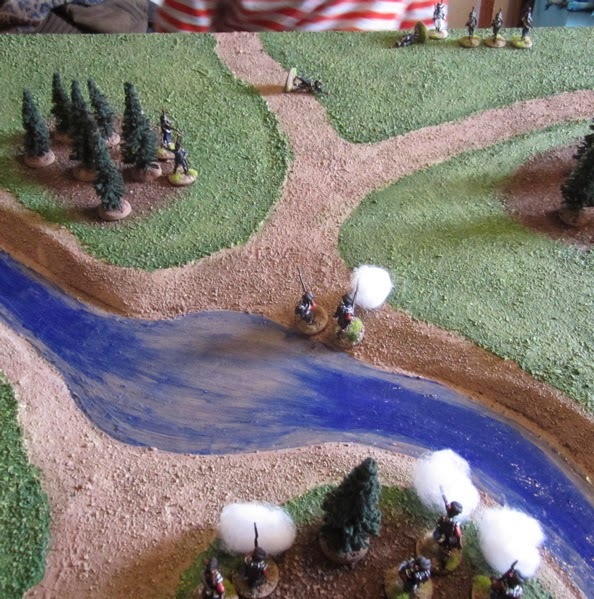 Ostensibly the object of the game was to “hold the ford” and if I’d given it much thought I’d have assigned victory points for being the first to it and maybe some for keeping the enemy on the other side and away from the ford… but ultimately, as with more SoBH derived games, it comes down to who routes (or wipes out!) the other force…. I must have added something up wrong when I came up with these forces…? 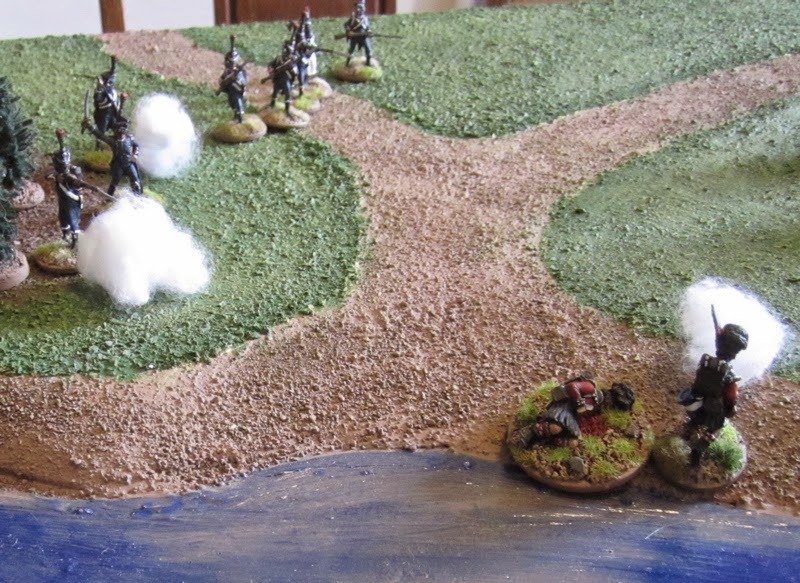 Finnegan decided he wanted to play the French, so I ended up with the Highlanders. 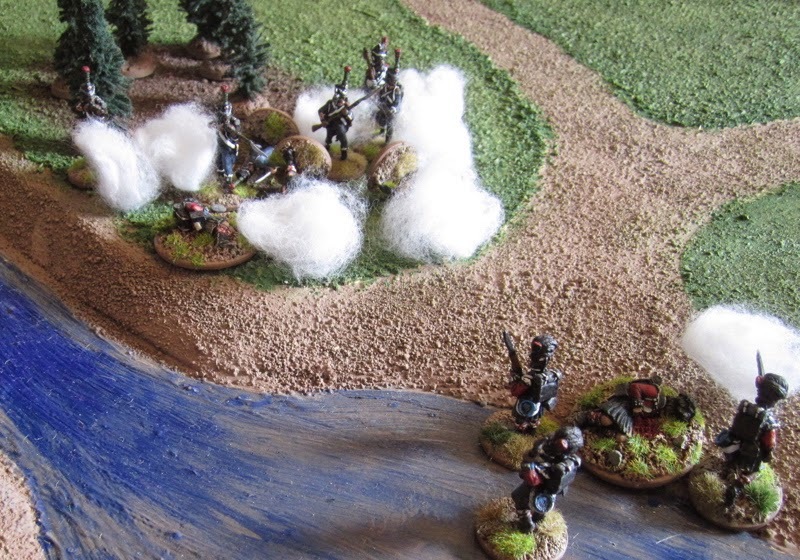 My Bonnie Highlanders cautiously approach the ford. Finnegan and his Chasseurs full of Élan and horseflesh. 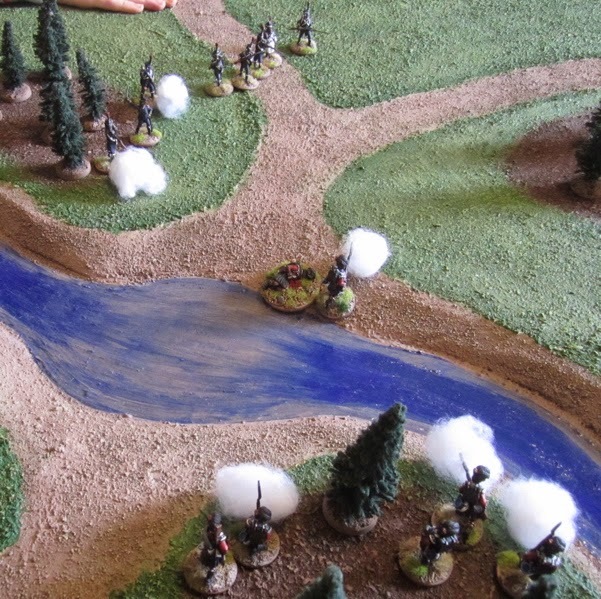 The two parties and their relative starting positions as they approach the ford. Did I say “cautiously”? 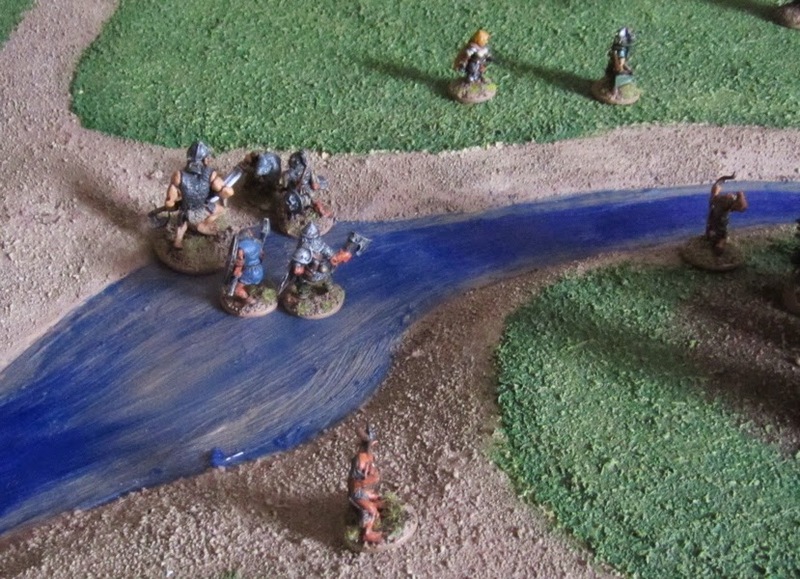 I meant “BOLDLY approach the ford!” In one move the whole squad was in position, in cover overlooking the ford. Huzzah! Finnegan had less luck ordering his Chasseurs (full of Élan and frogs’ legs) forward. 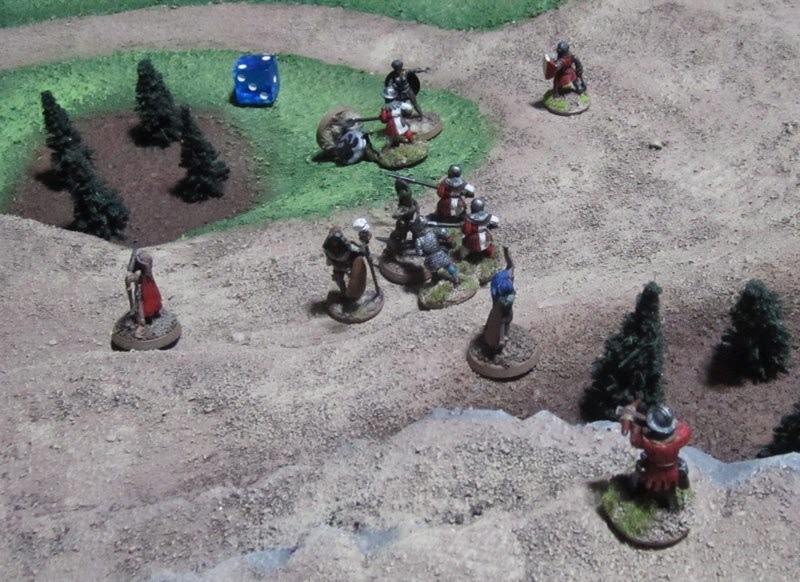 The Officer boldly lead from the front – but his men weren’t so keen to follow when they spied the bold swaggering Highland Lads across the water. 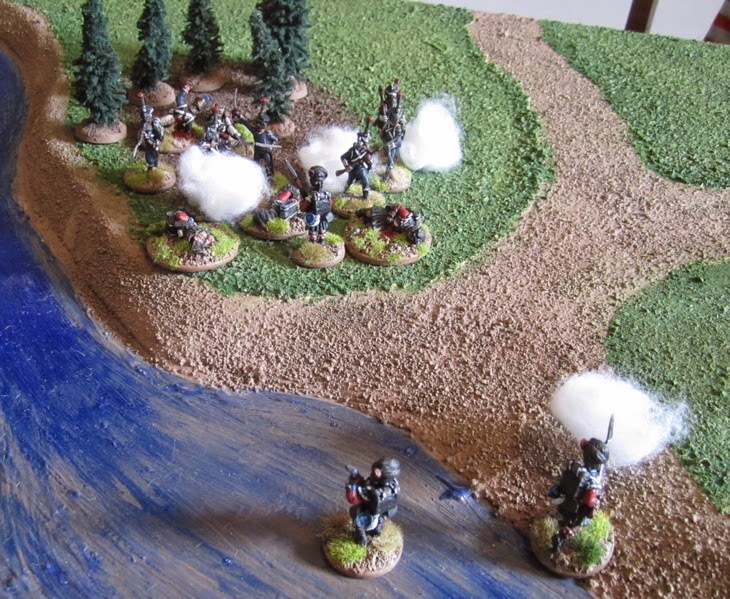 On my next turn I got a couple of the Jocks across the river and took a few long-ranged aimed shots – which caused a couple of the Chasseurs to duck – but didn’t succeed in causing any casualties or even a general route. I guess bullets whizzing by their ears while standing in the open had a bit more motivating power than the orders of their officer. 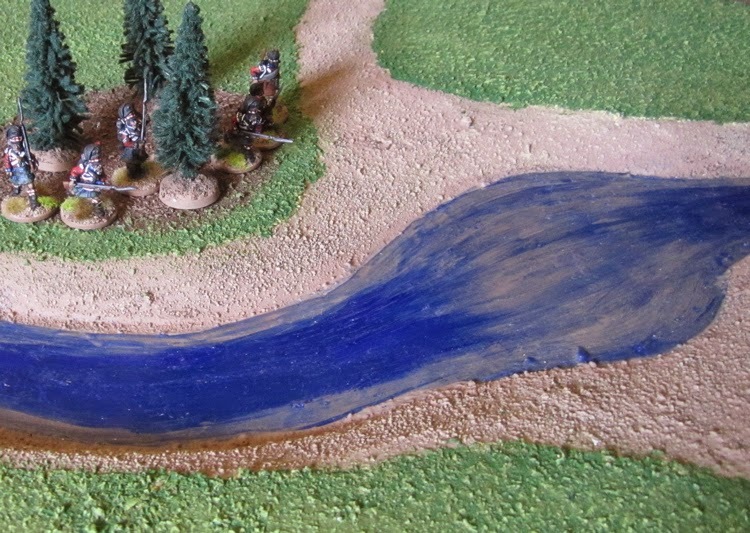 The Chasseurs rushed forward to the cover of the wood near the ford and began returning fire – wounding one of my Jocks!? Actually he probably wasn’t wounded… the shot probably went through his canteen and he spent the rest of the engagement trying to stopper it up before all his whisky poured out…. Then my luck went in the tank (where it normally resides)… When next they had the initiative young Pte William McDonald charged out from behind his tree towards the ford bellowing out a fearsome Highland war cry – but as his foot turned on a slick rock the cry changed in pitch somewhat and for the briefest moment sounded more like the cry of a wee girl being chased around the garden by her brother with a dead snake – before pitching headlong into the water. When Pte. McDonald sprang back up out of the muck he was covered head to toe in vicious black muck and his sodden kilt hung about his knees. Peels of laughter issued from the wood and that was all the Highlanders would do THAT turn! Lucky for me, I wasn’t the only one with no luck at all… Finnegan also rolled a turn over on his first activation of the next turn. I guess the French even had a bit of a laugh at Pte. McDonald’s Expense…. One of them fell to the ground and cried for his mama! 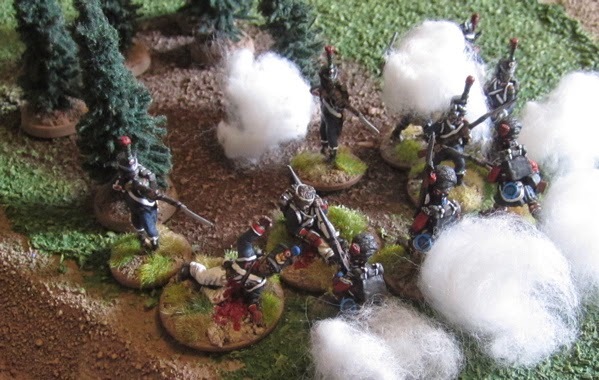 After the next volley from the French a few of the Jocks sprang up and charged the French position! 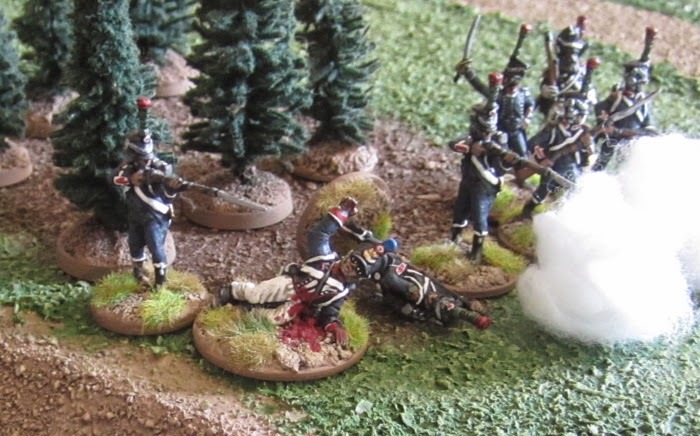 In the confused melee amidst the Jocks took down another Frenchman. 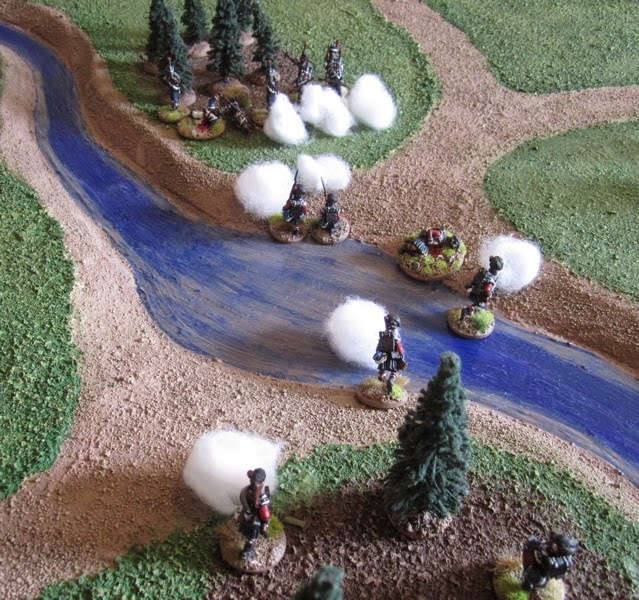 A second wave of Scotsmen charged into the French position taking down a pair of Frenchmen – evening the score. 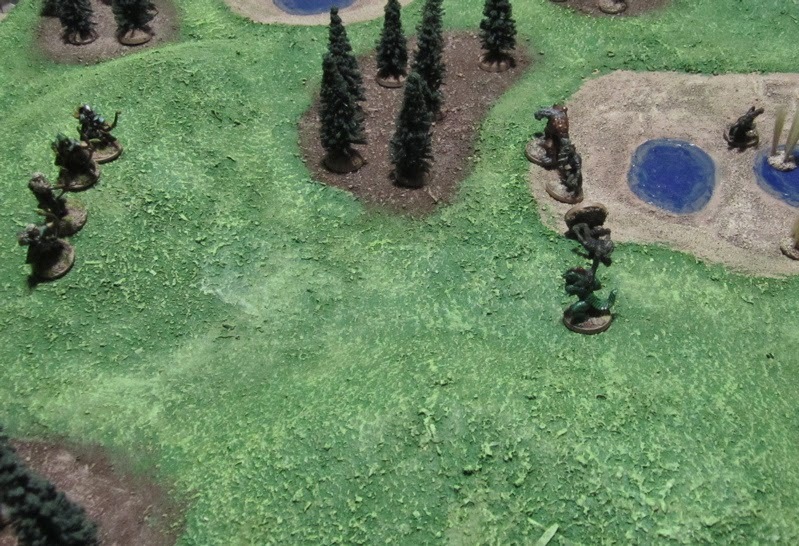 Whoever lost the next figure would be making a morale test…. 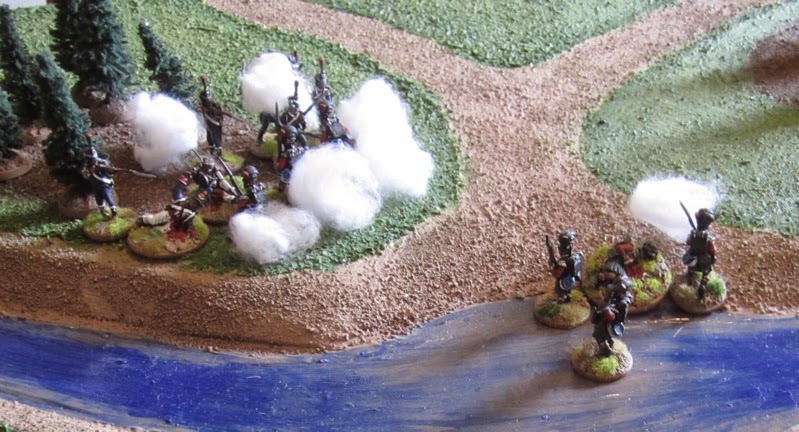 That left two highlanders fighting four Frenchmen… We probably could have carried on and I might have pulled off a win, but we had other stuff to do so we called it a day… All we were really after was to try out the system and see if it worked. I think it worked pretty good. I’d like to try it with cavalry. 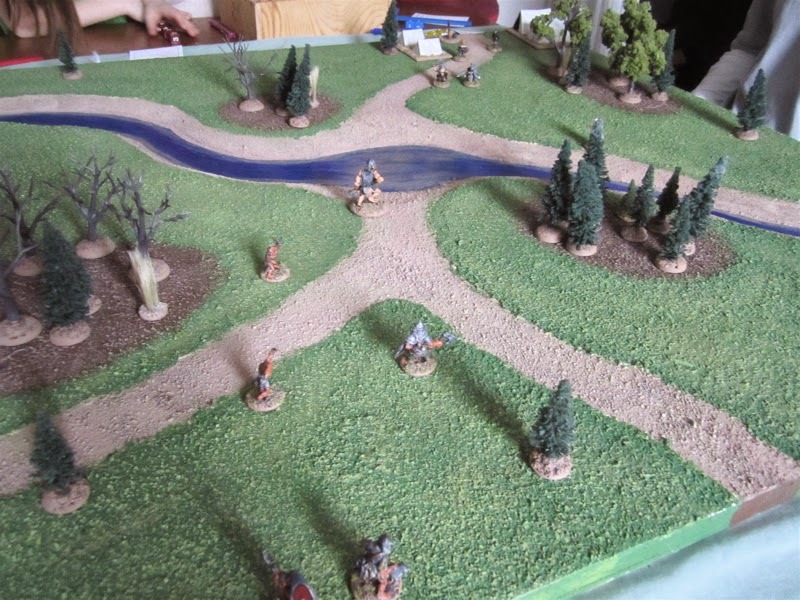 Hopefully I’ll get around to finishing the report for the end of our Song of Blades and Heroes Campaign. 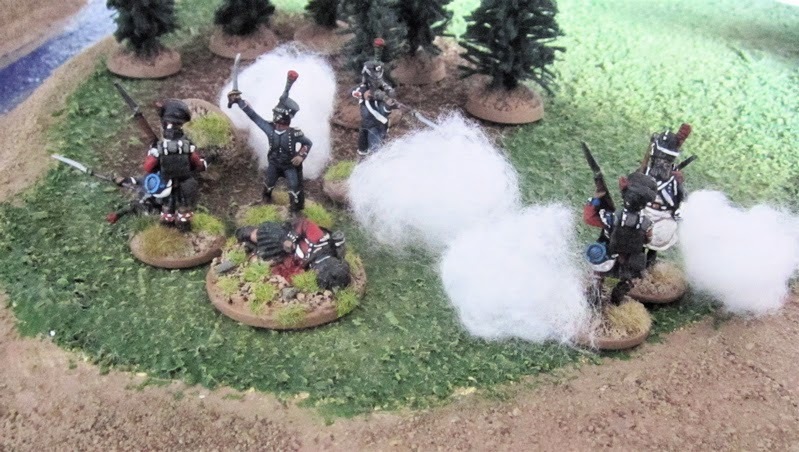 MORE French Napoleonic Light Infantry! ?